The BMW 3 Series wagon is one of the best European cars you can buy for a somewhat reasonable MSRP. Now that last part is important, because I don’t know what this dealership was smoking when it decided to order this wagon and sell it for this price. This is a brand new 2017 BMW 330i xDrive wagon, a car with a starting price of around $44,000. Now if you haven’t been following the BMW naming scheme don’t get all excited about the 330i designation: this car does not have a 3.0 liter straight six, which if it did would maybe justify the price, but alas this car has the same 2.0-liter turbocharged four-cylinder just like the last year’s car. In an attempt to make sense of this listing, I annotated the ad copy for your enjoyment. Good thing you put that qualifier in there, buddy, because the E61 M5 Touring that was never sold in America along with the one of a kind E46 M3 wagon, might say otherwise. Could it BE anymore beautiful finished in LAGUNA SECA BLUE?? This color is not my cup of tea, but I get it, it’s an M3 color. Does it have an M3 engine? No, just the 240 HP four-cylinder motor that comes standard, but you’re charging the same price as a new M3! This 330xi TOURING WAGON is EQUIPPED!!! Drivers Assistance Package, M-Sport Package, 20" Style 405M M-Performance Wheels, Premium Package, Technology Package, Rear Manual Shades, Heated Seats, Apple Car Play Compatibility, Wireless Handset Charging, Heads Up Display, Rear View Camera, Navigation with Real-Time Traffic information & Dynamic Guidance, Park Distance Control, Comfort Access/Keyless Entry, Enhanced USB & Bluetooth, Sirius Satellite Radio, Black Performance Grills, Carbon Fiber Mirror Caps, Rear Diffuser, Carbon Fiber & Alcantara Interior Trim, Carbon Fiber Selector Lever, M-Performance Rocker Decals, Front Aero-Splitter, Performance Analyzer (Android & IOS), Carbon Fiber Brake Handle, Painted Rear Spoiler, M-Performance Illuminated Door Sills, LED Door Projector AND MANY MANY OTHER OPTIONS! We get it, you checked every single option and ordered every possible factory tacked on accessory you could! However, this particular wagon, other than looking unique, does not perform or function any better than a new 330i wagon that one could purchase for much less. Now suppose such a nutjob existed—why would they buy this car? They could get a 365 HP Volvo V60 Polestar for far less money. Or for just a bit more, they could have themselves a lightly used Mercedes-Benz E63 wagon with more than 550 HP. So what possesses a dealer to stock a car like this? The only reasonable explanation I can think of is that some crazy customer ordered it this way, and at the last minute came to their senses and decided not to buy it. Now the dealer is stuck with it. 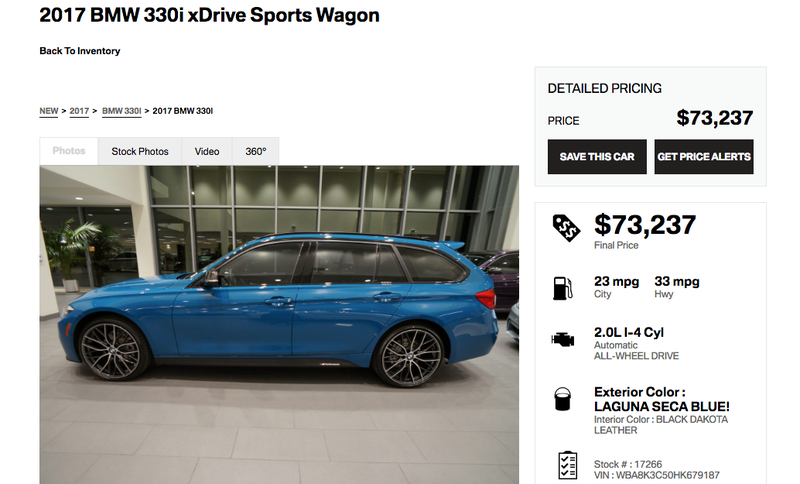 However, if there is anyone who sees a BMW 3 Series wagon wrapped in Laguna Seca Blue outfitted with every M Performance part available for $73,237 and thinks, “I gotta have it,” that person is likely a reader of this fine website.